A prize for the Chinese writer Han Shaogong. After Mo Yan two years ago, the Chinese writer Han Shaogong was awarded the Newman prize for Chinese literature from the University of Oklahoma. The selected writers: Yu Hua, Su Tong, Ge Fei and Li Ang were strong competition. His translator, Julia Lovell, a member of the jury, convinced the other members of the merits of his most famous work “A Dictionary of Maquiao” unfortunately not yet translated into French. Moreover, he is not one of these reluctant “educated youth”, he was Red Guard … Like many of his comrades, he idealizes memories of his work in the fields and regrets his idealism as a youth. Subsequently, he managed to study Chinese literature and in1985, English. That year he published an article that made him famous “The roots of literature” and two short stories “Pa pa pa” and Woman, woman, woman ” which are a show case of this literary movement. He confirms, writing in a book “Chinese Literature” (supervised by Annie Curien and Jin Siyan. Editions de la Maison des Sciences de l’Homme, 2001):”It is important not, as many Chinese and Western scholars are doing, to establish an equivalence between ‘old culture’ and China, new culture and the West.” It is also important to highlight the regional cultures in China which are likely to suffer from the dominant culture. At the same time he acknowledges the influence of Kafka, Robbe-Grillet and Garcia Marques on his work: defending “modern” literary approach for him is not contradictory with a new use of the past. But he has never been a supporter of the “realistic” writers like Fang Fang and Chi Li. 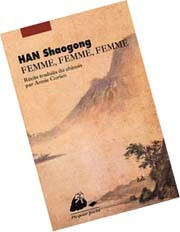 Apart from “Woman, woman, woman”, (translated from the Chinese by Annie Curien; Picquier poche), the works of Han Shaogong in French are only available in second hand bookshops or on the Internet; it is all the more regrettable as his major work was only translated into English. With “Pa pa pa”, translated by Noel Dutrait and Hu Sishe, Han Shaogong created a symbolic character as Lu Xun did with Ah Q. The hero, Bing Zai, is a mentally retarded child who, abandoned by his father, lives with his mother in a mountain village. Bing Zai does not talk, he screams only that Pa pa pa and an insult; he stopped at the pre verbal stage, he has no identity and reflects the obsessions, fears, cruelty, ignorance of many villagers that the author was able to meet.This book becomes a symbol that carries the negative aspects of Chinese tradition. In “Woman, woman, woman”, aunt Yao has many handicaps, she has poor hearing, she suffers from the old ways and was rejected by her village after the death of her child. In town, with his nephew, she supports the Maoist creed and complies with the formal models. Her adopted daughter on the contrary is intoxicated by the individualistic values of the post Maoism. The book is a compromise between the traditional Chinese literary techniques and some “modern”. The portrait of Aunt Yao is powerful and marks the limits of women’s liberation during the Maoist period. After these two short novels, three collections of short stories were published in French: “Seduction” ( P. Picquier-1990) for short stories written between 1985 and 1987, where the influence of the literary techniques is sometimes a bit heavy. “Enigmas of an empty house” (Panda, Beijing 1993) where the memory of years in the contryside is quite obvious.The same goes for “Noises in the mountain” (Gallimard, 2000), with very good texts from the years 1990-1995 translated by Annie Curien; sometimes we can even think of short stories by Shen Congwen.The past, ancient traditions which are still there, a little magic, a lot of cruelty. The latest published short story, “The Earth” (translated by Prune Cornet in “ Franco-Chinese Literary Dialogues”, published by Maison des Sciences de l’Homme, 2010) is of high quality; it was written within the program ALIBI, managed by Annie Curien; these “literary bipolar workshops” allow the debate between two writers and two translators around their text rendered in the language of the other around a common theme. ”This is the rather pleasant way of life which led the ancient Chinese scholars who are said to be plowing the fields in good weather and were devoted to study during rainy days”. This existence allows him to publish in 1996 “A Dictionary of Maqiao ‘(translated by Julia Lovell; Columbia University Press, 2003), a book that was supported by critics in English speaking countries. A strange book with words that introduce short essays but with characters that are sometimes found at several places. This is neither a novel nor an essay, that’s life of Maqiao villagers in north-eastern Hunan and it is a reflection on time and language.